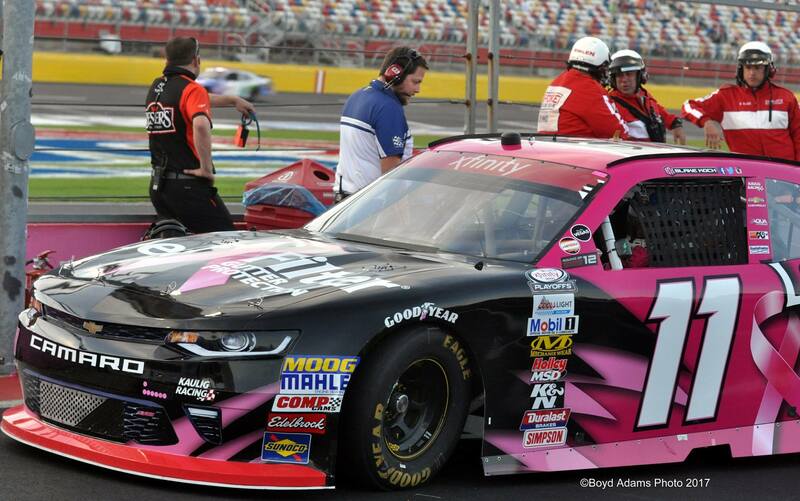 CONCORD, NORTH CAROLINA — Growing from fog to mist to a steady down pour, wet conditions have so far kept cars off Charlotte Motor Speedway’s banks – qualifying for the Drive for the Cure 300 was never attempted. Per the rule book, the field has been set by owner’s points, key word being owner, as the line up of 40 cars will not start identical to the current driver’s championship points standings. 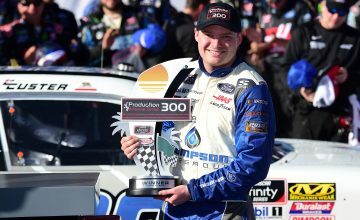 Three current Monster Energy NASCAR Cup Series drivers, and one future driver will start ahead of the NASCAR Xfinity Series playoff contenders. Daniel Suarez will pilot the No. 18 Juniper Toyota for Joe Gibbs Racing, Ryan Blaney roll across the start/finish line along side his MENCS competitor in the No. 22 Discount Tire Ford for Penske Racing. Behind them, in the second row, will be, Erik Jones in third and, Alex Bowman, the future driver of Hendrick Motorsport’s No. 88 cup car. Firing their engines directly behind the gaggle of young cup talent are five NXS playoff contenders. Leading the standings, and starting fifth is, Justin Allgaier. 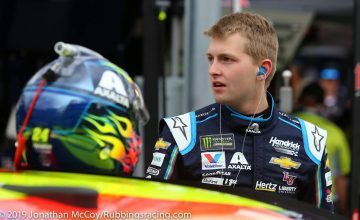 With three less points, William Byron finds himself starting sixth. Ten points back is, Elliott Sadler who is still looking for his first NASCAR championship. He will roll off the grid in seventh. Daniel Hemric will start to the outside of Elliott even though Cole Custer is the next driver in the playoff standings. Instead of starting the three hundred mile event in eighth Custer will be mired in thirteenth. 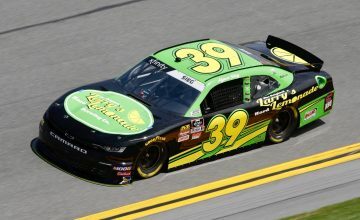 Brennan Poole will begin ninth and Ty Dillon will round out the top-ten thanks to owner points accumulated for Richard Childress Racings’ No. 3 Advil Chevrolet. 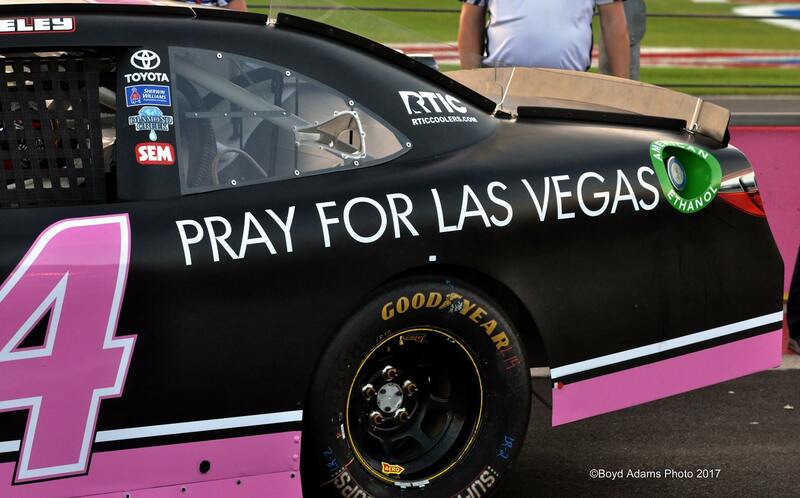 Quite a few NASCAR drivers hail from Las Vegas, Nevada. In response to last Sunday’s massacre race teams have taken to displaying decals in support of the victims and the impacted community. Photo by Boyd Adams.Aside from Austin Dillon in twelfth, six playoff drivers start between eleventh and seventeenth. Ryan Reed (11), Custer (13), Matt Tift (19), Blake Koch (15), Brendan Gaughan (16), and Michael Annett (17). The last seeded playoff driver, Jeremy Clements will start twenty-third. It could be of interest to note, using his past champions provisional, Jeff Green will start thirty-second. This decision by the team of the No. 38 car put them in the race, as they had the least owner’s points. The move bumped Dexter Bean, driver of the No. 92 car out of the field as one too many cars attempted to qualifying for the 40 car race. 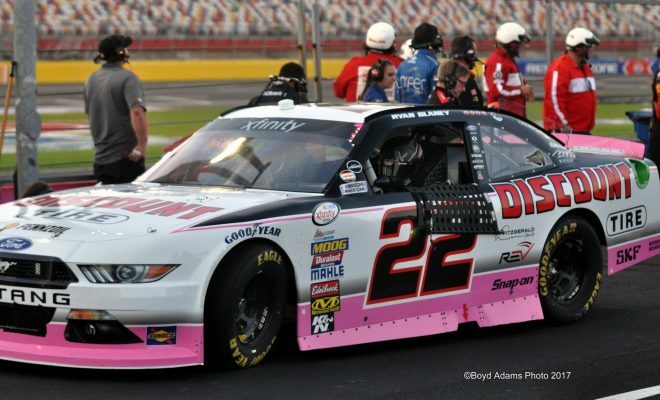 October is breast cancer awareness month, in response a large number of teams have incorporated the color pink into their paintschemes. Photo by Boyd Adams. The Drive for the Cure 300 is a cut off race in the round of twelve for the NXS. As the points stand Gaughan (-2), Annett (-7), Koch (-12), and Clements (-20) are behind the cutoff line of eighth in the standings. Reed occupies the last transfer position, with only a handful of points keeping his championship hopes alive the battle for position on track will be fierce throughout the event. Starting near his closest competitors will only serve to amplify this tension. Any points that can be gained by way of stage points will be vital in determining who will transfer to the second round of NXS playoffs.